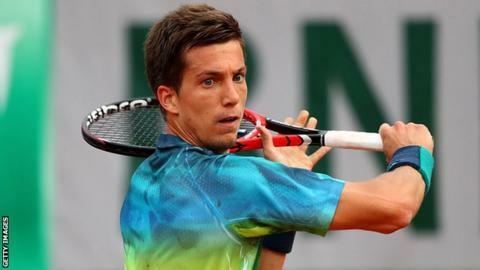 Britain's Aljaz Bedene has replaced Jo-Wilfried Tsonga in the main draw at the Aegon Championships at Queen's Club. Tsonga, 31, has pulled out with the same adductor problem which forced him to retire from the French Open. It will be the first time Slovenia-born Bedene, 26, has represented Britain at Queen's Club, following his nationality switch in 2015. He reached the third round at Roland Garros last month - the furthest he has progressed at a Grand Slam. Queen's is part of the ATP World Tour 500 series and leads up to Wimbledon, which runs from 27 June to 10 July. Defending champion and British number one Andy Murray will be aiming for a record fifth title when the event starts on Monday. Former French Open winner Stan Wawrinka, and fellow top 10 players Milos Raonic and Richard Gasquet, are also part of the line-up.